You can win Freebies and enjoy Exclusive Discount on Rowkin Every Month ! We’ve recently launched a new program to reward our loyal customers for providing their feedback using Rowkin products. We value your feedback to better improve the Rowkin experience for everyone! 1. Grab Your Favorite Rowkin Product! Grab your favorite Rowkin product and be ready to tell us your experience! Don’t have one? Shop your favorite on Rowkin.com. 2. Write and submit a review on Amazon.com. Type “Rowkin” in the search box. Select the Rowkin product you own. 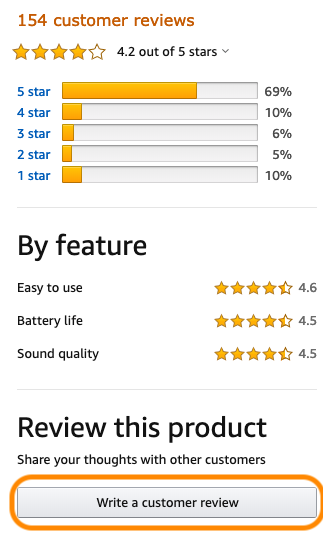 You will find a “Write a Customer Review” button on the left side at the customer review section towards the bottom of the product page. 4. Fill out your review! After clicking through the “Write a customer review” button, follow the step instructions to fill out your review. Don’t know how to screenshot? You should now see your screenshot - save this under a filename. Use your phone to take a picture of the screen and upload it to your computer! Upload Your Screenshot under Question 6! Now, you can sit back and wait for us to verify your submission when your Amazon review is live to public. Once we validate your Amazon review, you will receive an email to confirm your entry of our Monthly Raffle. Plus, you may also find something extra that you will like in the email. Please Note: Every verified review will be eligible for a raffle for 3 months. We will announce the winner of the monthly raffle through our newsletter and social media during the first week of each month! So please make sure to join us on Facebook and follow us on Instagram @rowkininc, Stay tuned with our newsletter! Thanks again for joining the Rowkin family!